Montgomery & Pattison were William A. Montgomery (1847-?) and Henry J. Pattison (1844-?). Montgomery was an immigrant from Ireland, and Pattison from England. They both appear in New York city directories around 1874/1875. They were partners in the plumbing business by 1888, and were located at 256-258 West 18th Street from that time until 1900. Their petition for bankruptcy (New York Times, 21 Dec. 1900, p. 15) reads, "William Montgomery and Henry J. Pattison, composing the firm of Montgomery & Pattison, plumbers, of 256 West Eighteenth Street, have filed a petition of bankruptcy, with liabilities of $18,221 and nominal assets $9,683, consisting of notes, $2,177; stock in trade, $800; tools, $400; wagon, $100; book accounts, $6,606. They also have a judgment for $6,000 against Platt & Marie, which it is stated is not known to be of any value. Each partner has individual assets of $200 consisting of vacant lots at Yonkers. They have been in business since 1886, and were previously for sixteen years journeymen in the employ of the United States Government, one in the Treasury and the other in the Navy Department." 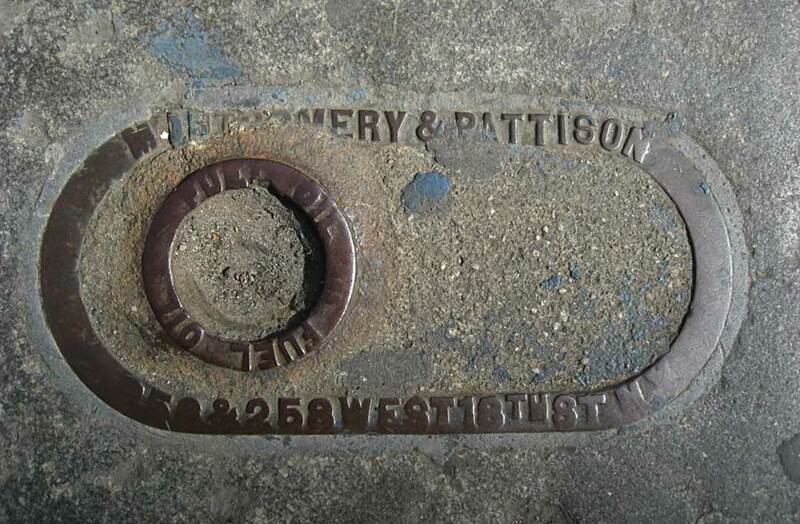 This particular piece of sidewalk furniture, then, was more than one hundred years old in 2009. Both Montgomery and Pattison are found in the U. S. Census of 1870. Pattison's application for naturalization, 8 April 1870, was witnessed by his father, John Pattison, a house painter, when they lived at 237 West 18th St., Manhattan. The Pattisons still lived at this address in the 1880 census. By the time of the 1910 census both men had left the plumbing trade. William Montgomery lived at 118 Waverley Place near Washington Square Park, and was employed as a "Clerk, Dry Goods." Henry Pattison lived on Morris Park, the Bronx, and listed his occupation as "Operator, Real Estate." The Fuel Oil rim probably is not related to Montgomery & Pattison. Their piece seems to be the rim of a sidewalk drain that has been filled in with concrete.